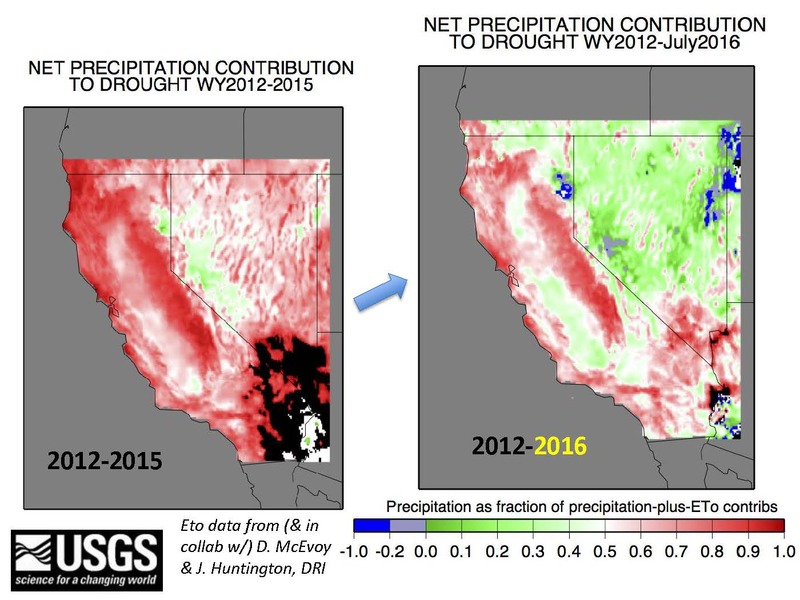 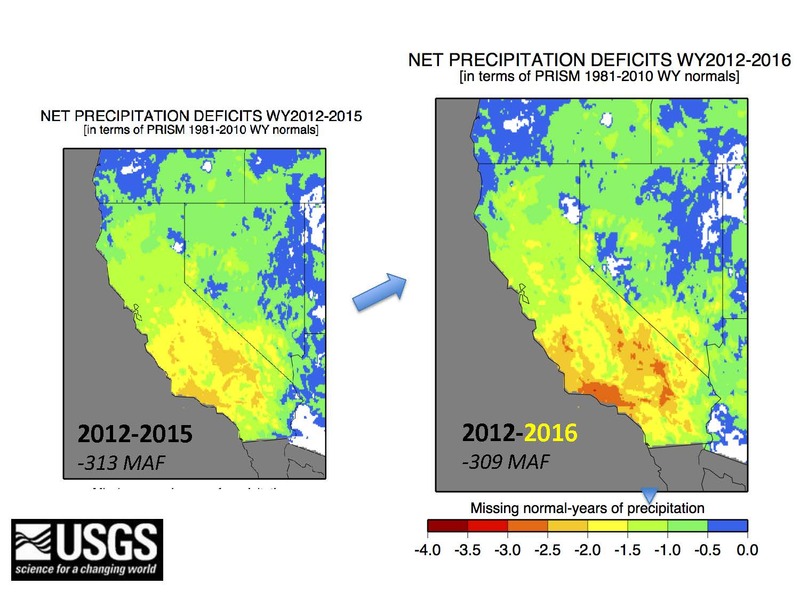 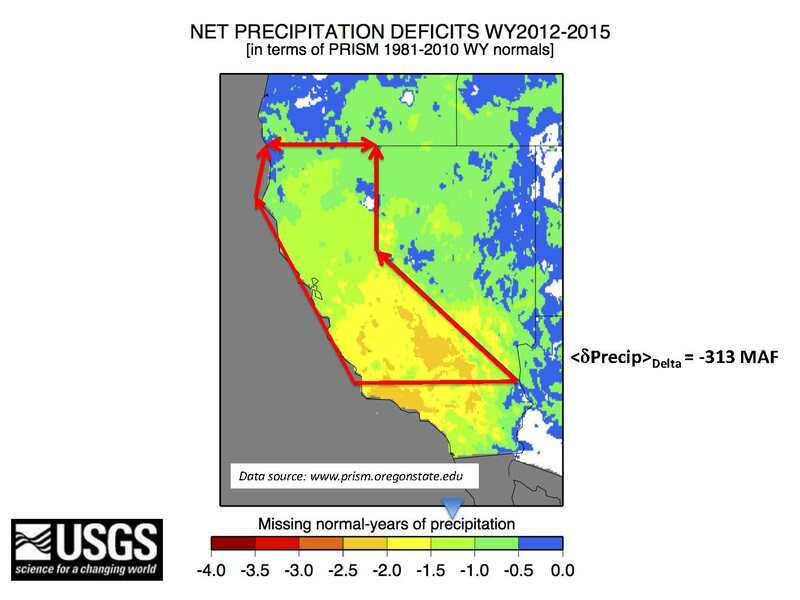 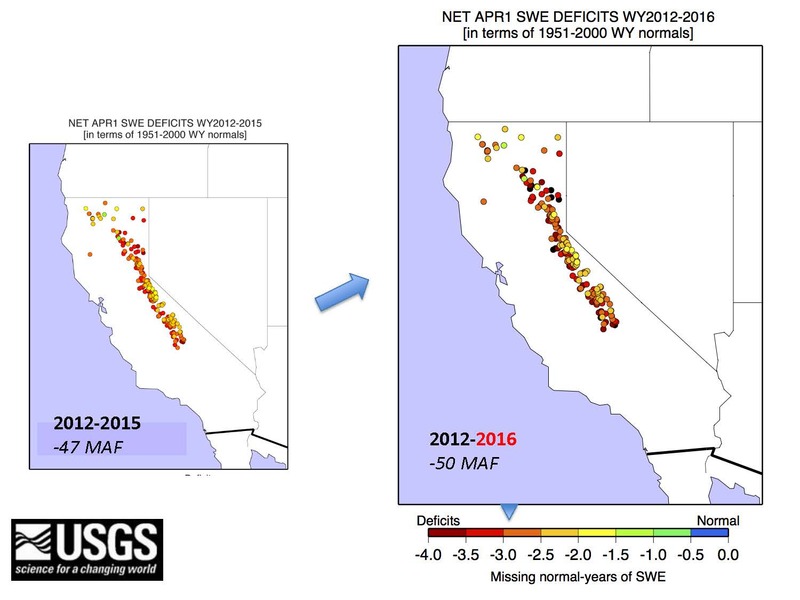 California, currently in its fifth (and possibly sixth) year of severe drought, is now identified with large shifts towards persistent dry periods, separated by large storms, and accompanied by record-breaking warm temperatures. 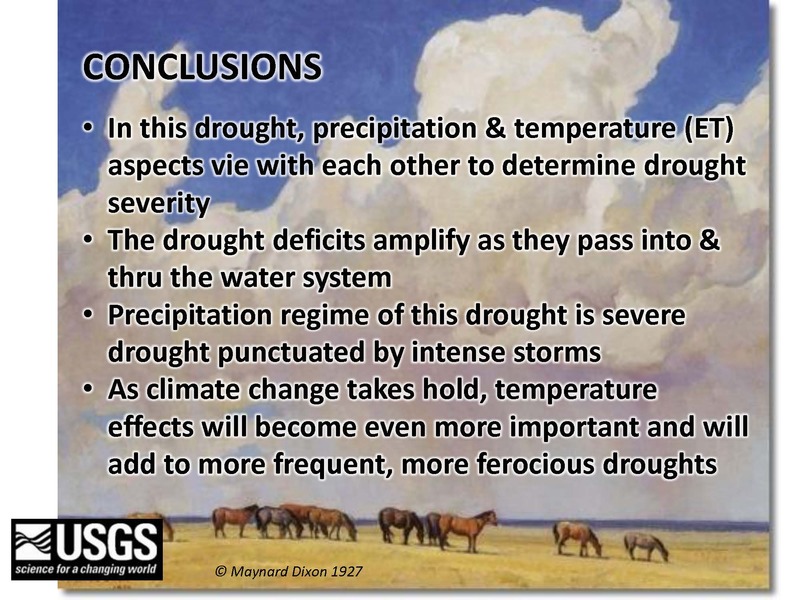 These conditions are characteristic of droughts projected to accompany climate change. 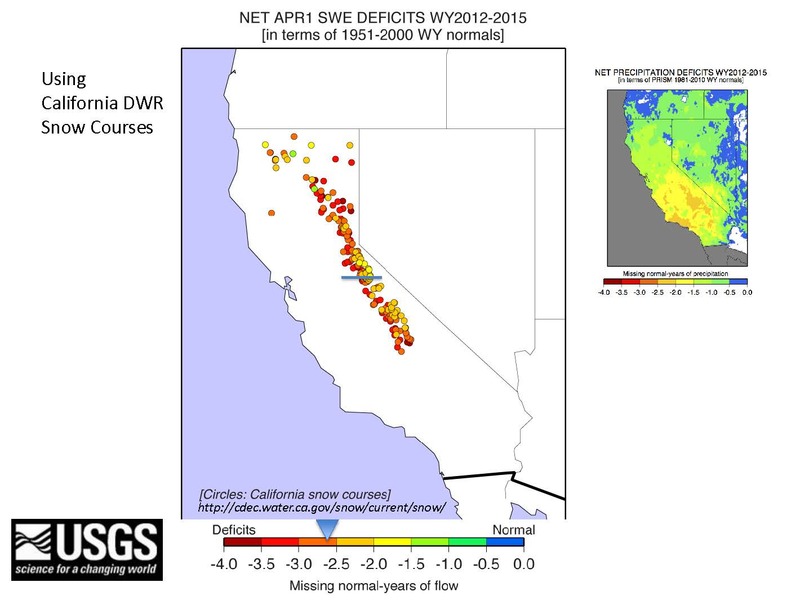 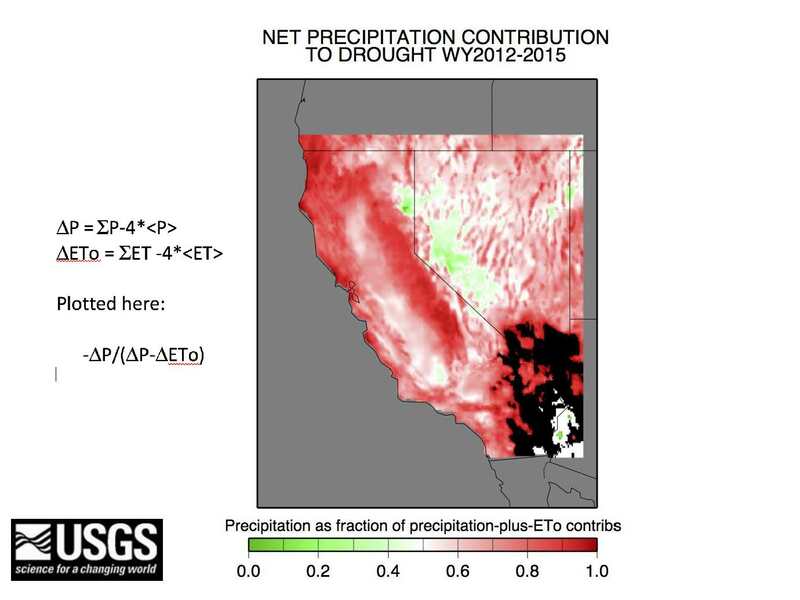 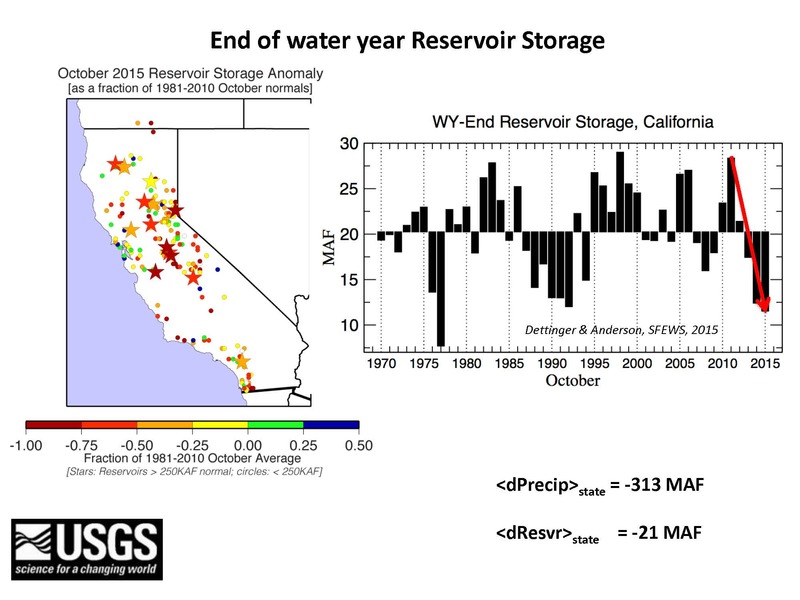 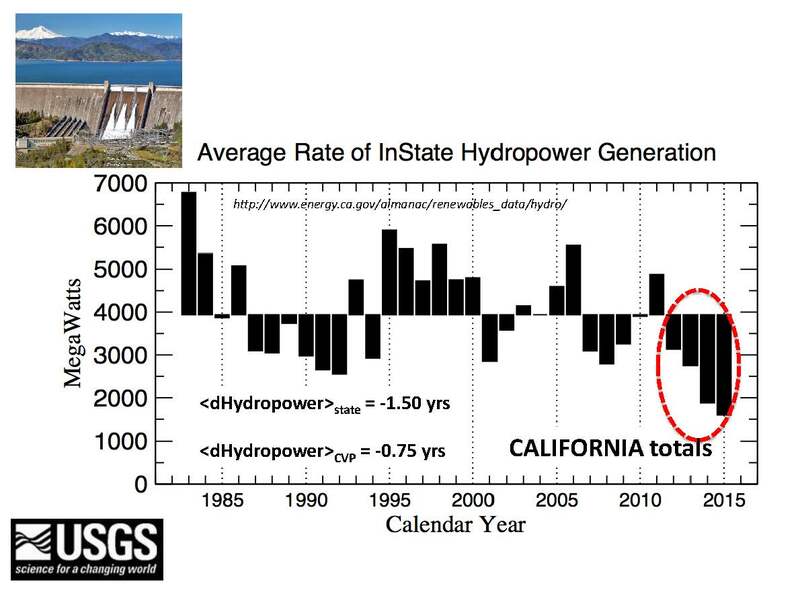 At a brown bag seminar held in September of 2016, Dr. Michael Dettinger, a Senior Research Hydrologist for the USGS National Research Program, presented his analysis of the multi-year deficits that have accumulated during this drought including deficits in precipitation, snowpack, streamflow, reservoir storage, and hydropower generation. 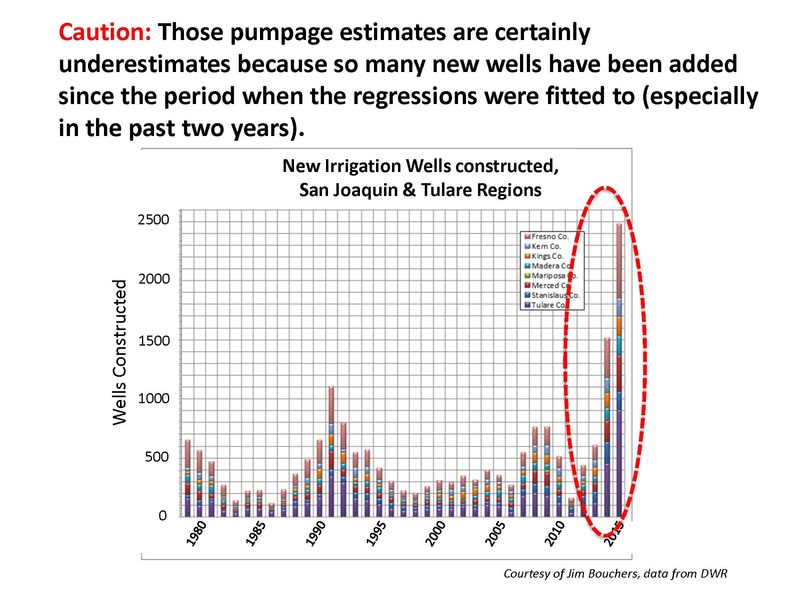 Dr. Dettinger said he had dug into these questions because he was trying to understand which parts of the system were being hit hard by the drought, and which ones weren’t, and to trace the drought influences through the state’s water systems. 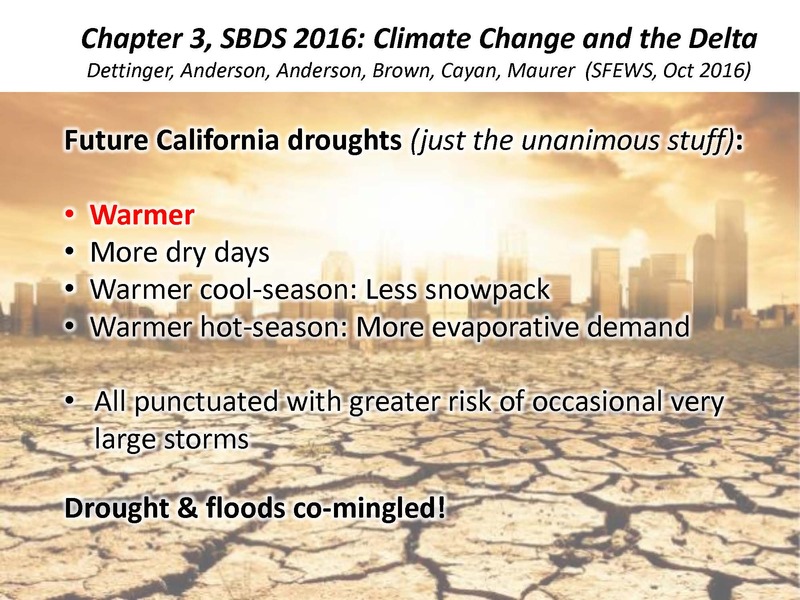 These things include warming by a couple of degrees Celsius by mid-century, and by about 4 degrees by end of century; sea level rise from 80 centimeters, perhaps a meter or more, and with high-end projections that go two or three times that, depending on who you want to listen to, he said. 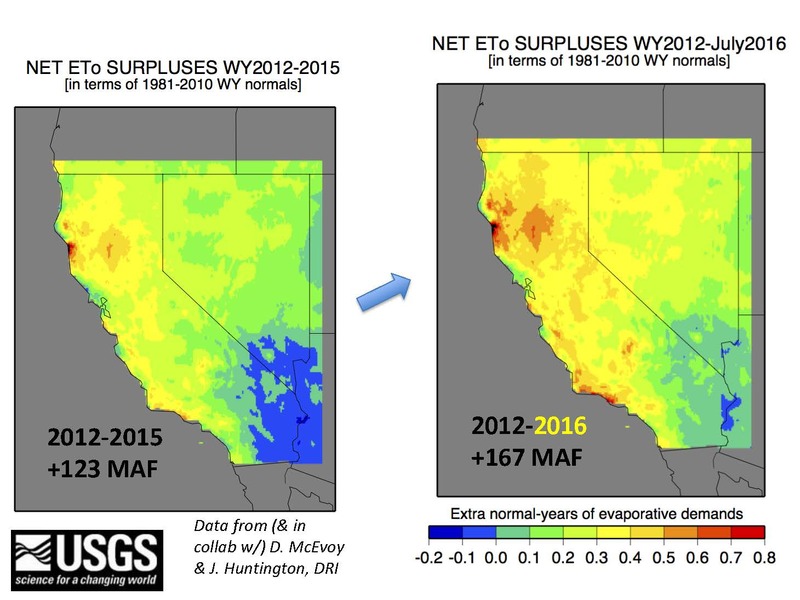 “It’s all punctuated greater risk of occasionally very large storms, so that we have this future of warm droughts and floods,” he said. 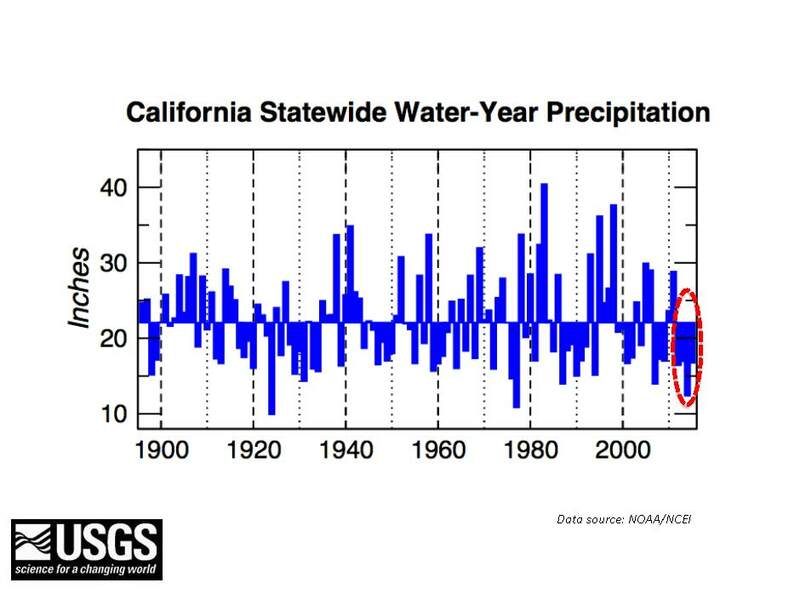 Dr. Dettinger began his analysis of the current drought by presenting a slide showing statewide water year precipitation from 1895 to 2015, noting that the bars pointing down means its less than the long-term normal for that period and the bars above the line were wetter than normal. 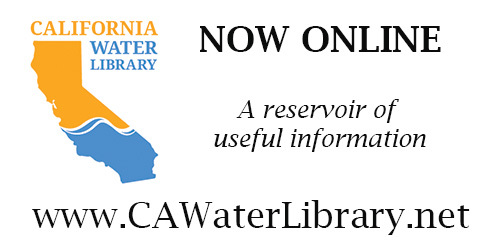 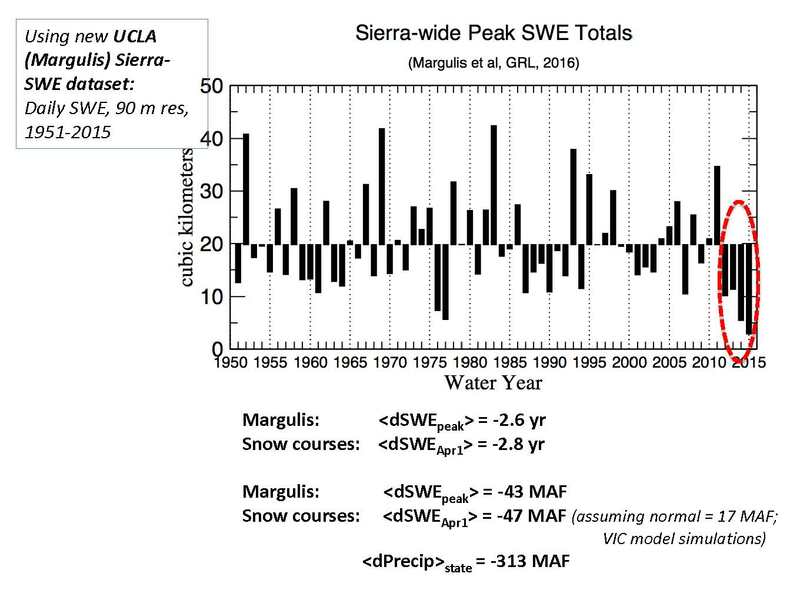 A new product from Dr. Dettinger’s colleagues at UCLA is a new Sierra Snow Water Equivalent dataset that has daily estimates of the snow water equivalent on 90 meter resolution across the whole of the Sierra Nevada from 1951 through 2015. 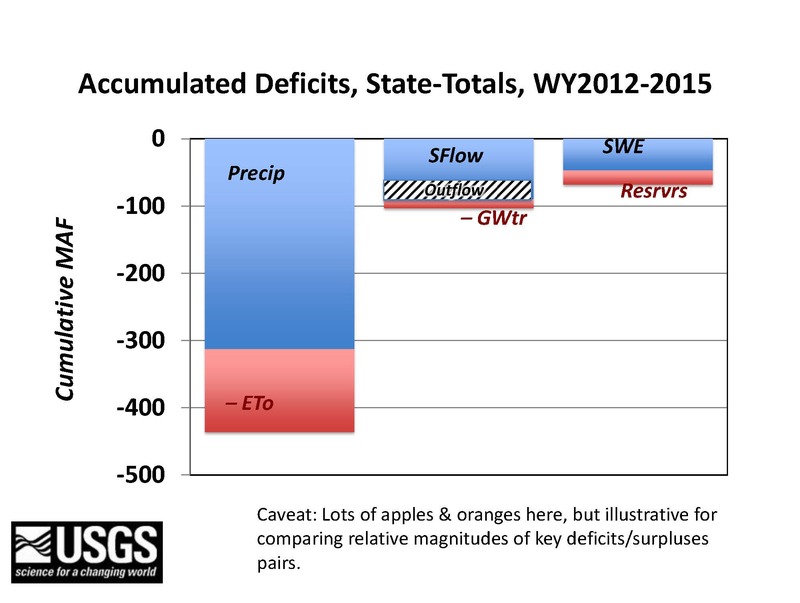 Dr. Dettinger could only obtain summary statistics, which is plotted on the slide. 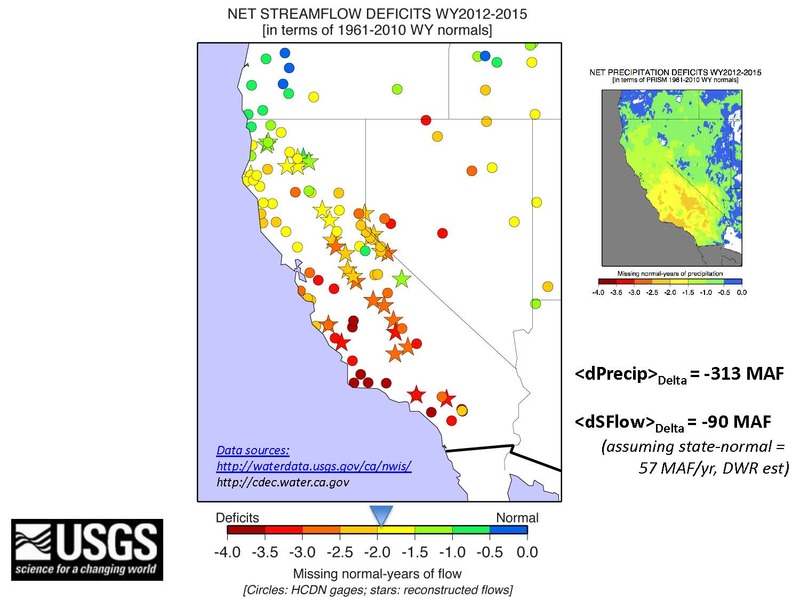 He then presented streamflow accumulated in the same way, explaining that this is estimating how much streamflow that hasn’t been there at stream gauges that would have been there under normal conditions over that 2012-2015 period. 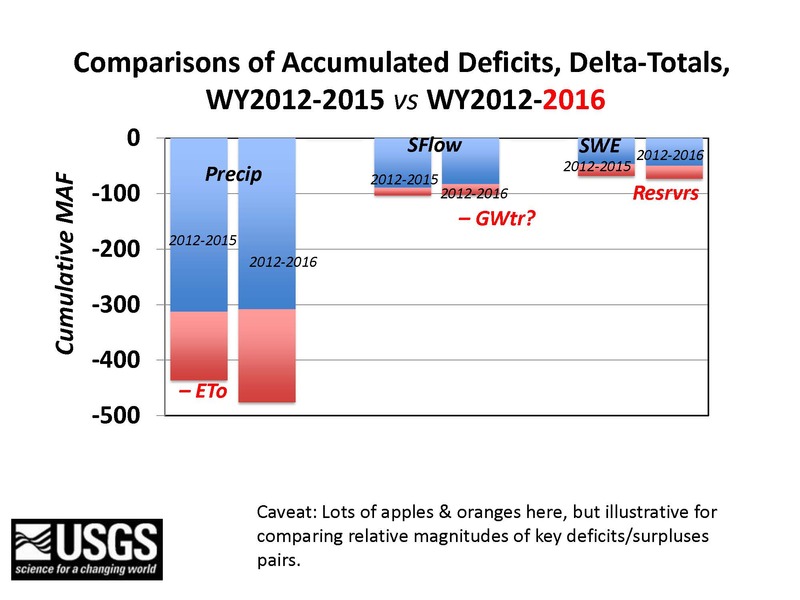 He said for this calculation, he used two different data sets. 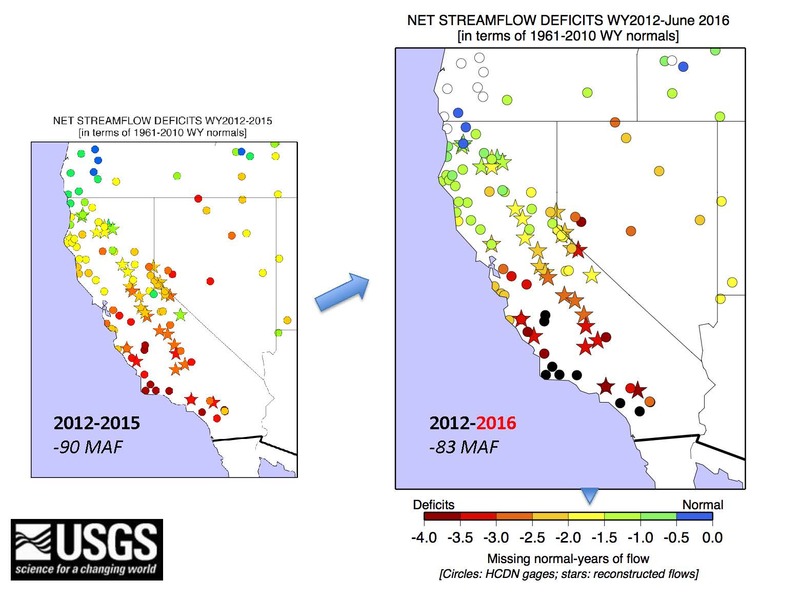 One is the USGS HCDN (Historical Climate Data Network), indicated by circles on the map, which are a set of stream gauges which have no dams and few if any diversions upstream, so they are measuring more or less natural conditions. 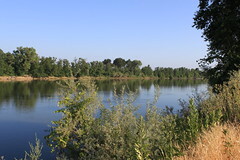 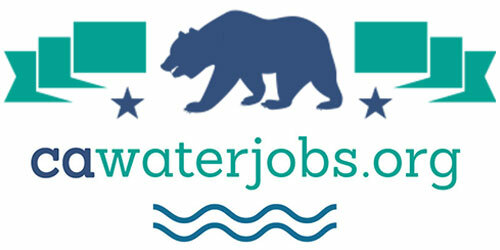 The other set are DWR’s Full Natural Flows, indicated by stars on the map; these are records, often on the largest rivers, where DWR has tried to back out all those human influences and come up with their best shot at what the natural flows would have been. 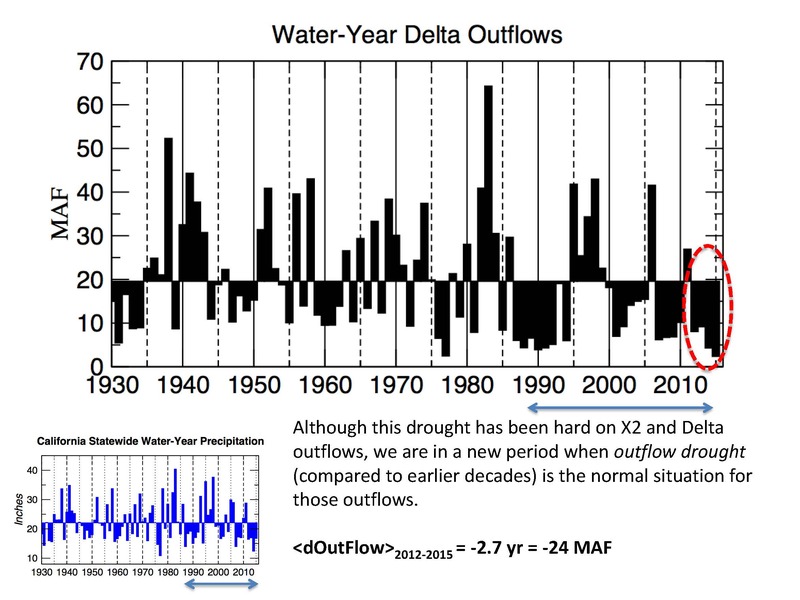 “Again, converting everything I can into the same units, the accumulated Delta outflow deficit has been about 2.5 to 2.7 years behind over those years and about 24 MAF of water behind,” he said. 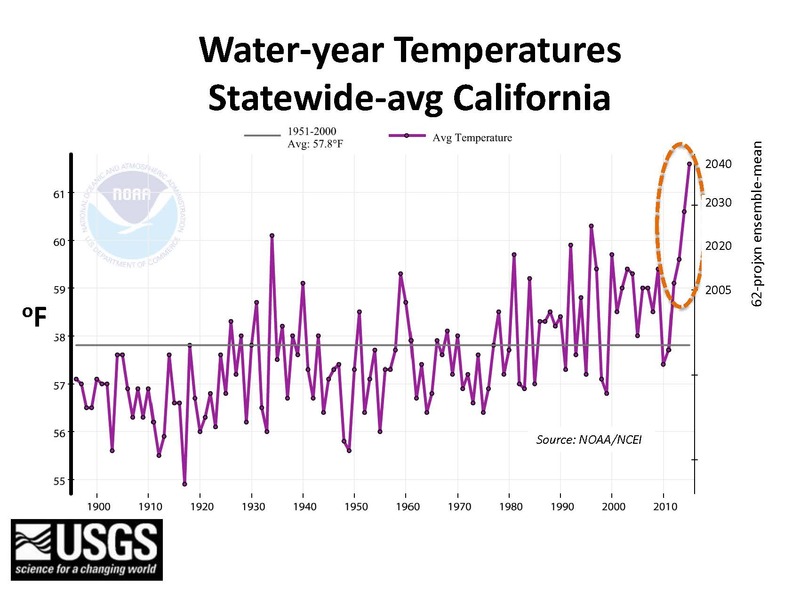 Dr. Dettinger pointed out that precipitation totals haven’t been record-breakingly low, but the temperatures have been recording breakingly high during that period. 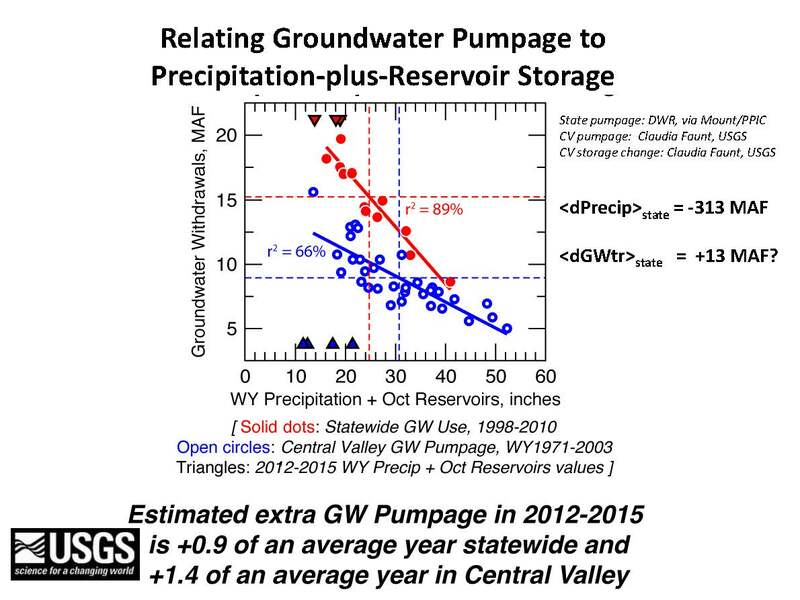 Dr. Dettinger lamented the lack of groundwater data currently available, so exact calculations of groundwater pumping are not possible. 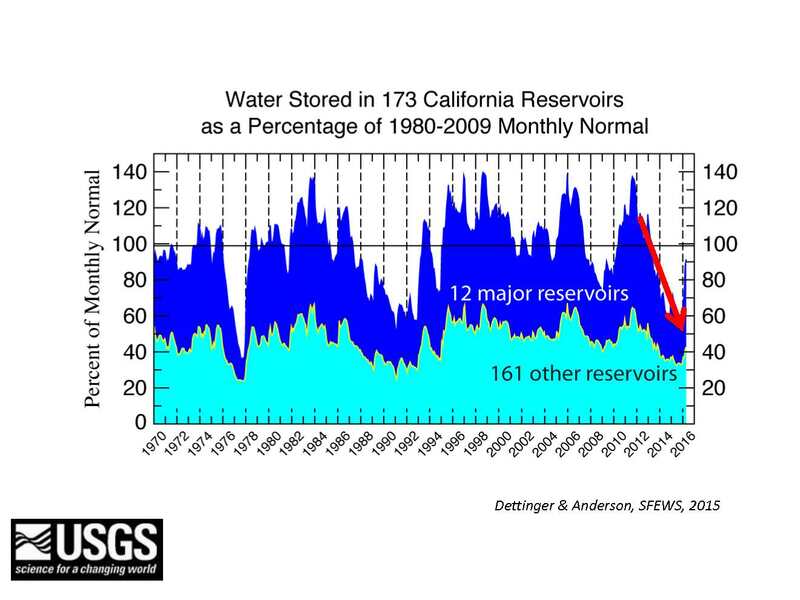 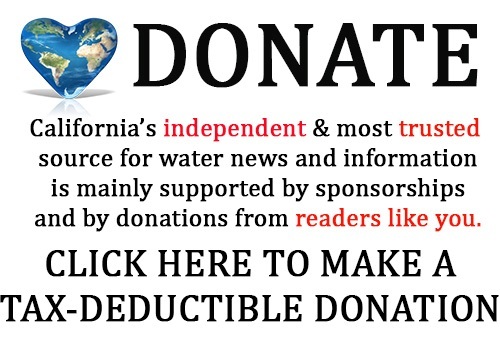 “An obvious question at this point is less streamflow, less snow, less water in the reservoirs, more evaporation, how much is the extra groundwater pumpage that’s been going on,” he said. 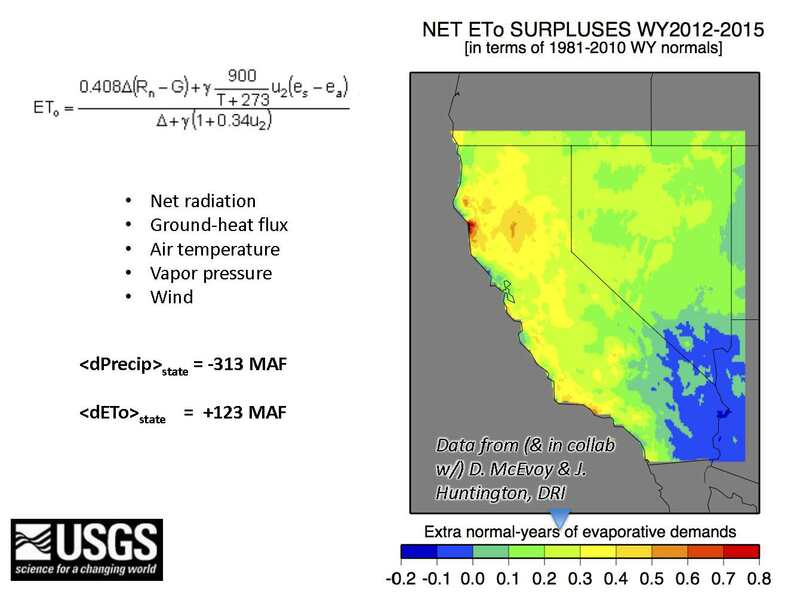 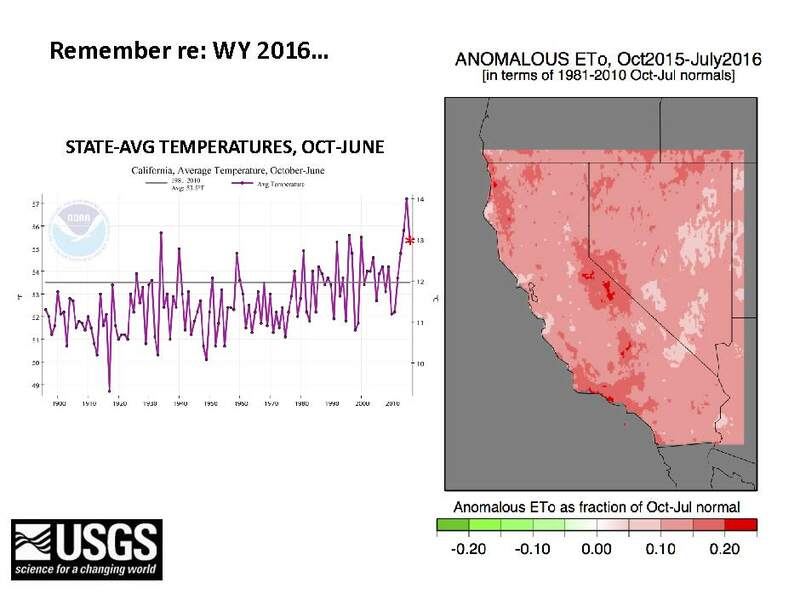 “Remember, we had a not bad year at all in Northern California; it was slightly above normal in many places, but those temperatures keep eating at our snowpack nonetheless,” he added. 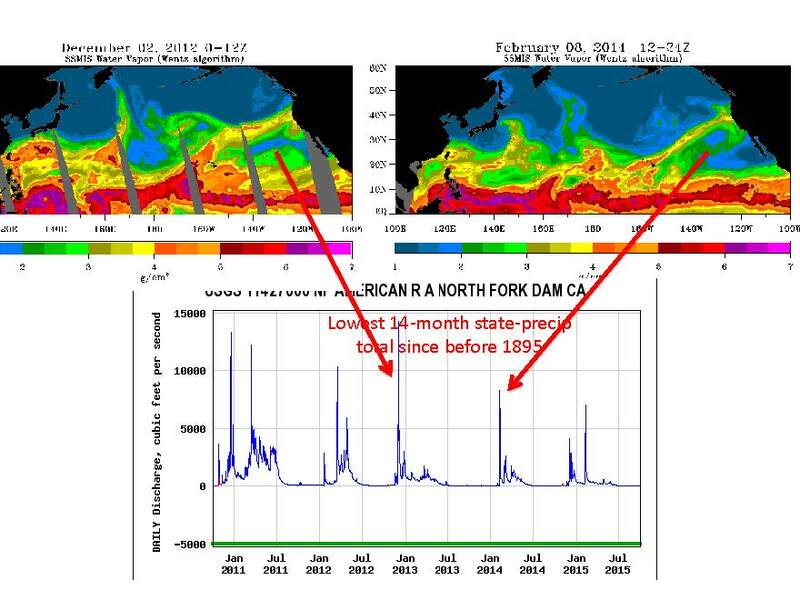 He said DWR climatologist Michael Anderson pointed out to him that it began right after a major atmospheric river storm, and it basically ended with the arrival finally of another major atmospheric river storm. 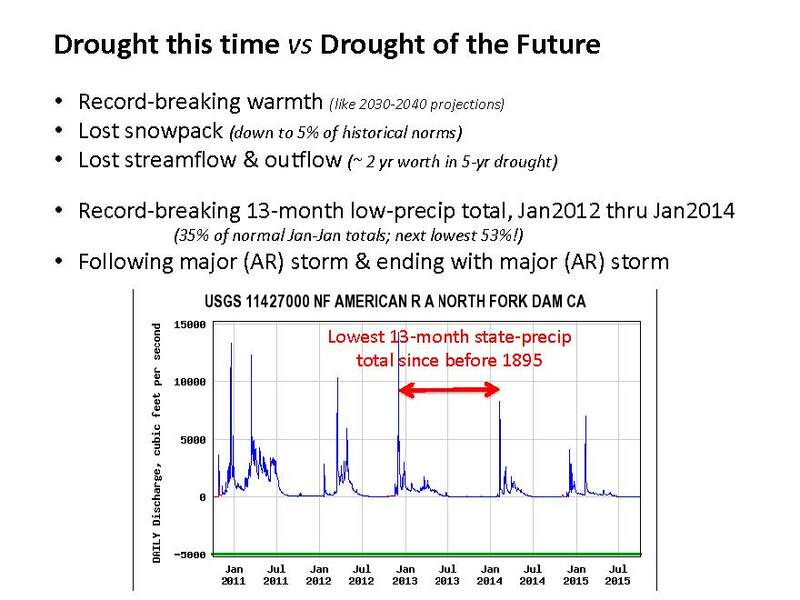 “I started out by saying that the future drought will be these more persistent warmer droughts punctuated by large storms, and we have in the midst of this drought something that looks like what you might want to imagine these future droughts would look like,” he said. 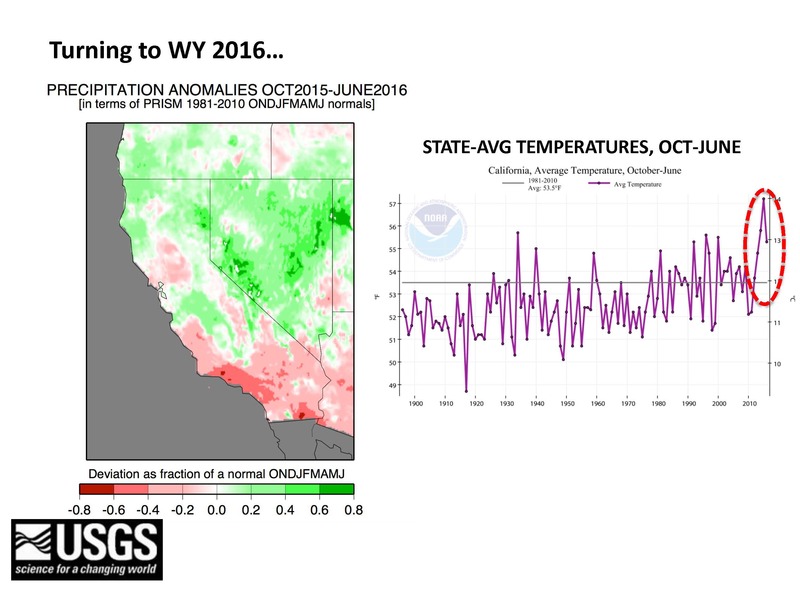 Click here to watch the presentation video.